Tell Them Honest Abe Sent You - President's Day at Seaport Hotel. President’s Day Weekend doth approach, and if there’s one thing Honest Abe would want, it’s that you make it down to the Seaport Hotel and World Trade Center to celebrate his honor at the 25th Boston Wine Expo. Okay, we can’t be entirely sure of his wishes, but the event does benefit Tufts Medical Center’s Summer Camp Program for Children with Disabilities—so cheers yourself while here for being patron to a great cause! Along with delectable food demonstrations by superstar chefs like Ming Tsai, Barbara Lynch, and Chris Coombs, the BWE will also be host to wine seminars presented by the Boston Guild of Oenophilists. Industry experts and winemakers from around the world will be on hand for over 40 different topics like how to best pair food and wine, discovering the best bottle bang for your buck, and how to make you a wine expert in an hour! Trust us…after a few of these classes, you’ll quickly become the go-to sommelier of your social circle. If you’re looking for something a bit more exclusive, the Vintners’ Reserve Lounge is the place for you. A gathering for serious enthusiasts in the Seaport Hotel’s Plaza Ballroom, this soiree is set apart from the main Grand Tasting area and allows guests to sample wines that retail for $75 and up per bottle. The special dessert bar in the ballroom will give the perfect, sweet pairing for the exquisite vintage swishing around in your glass. 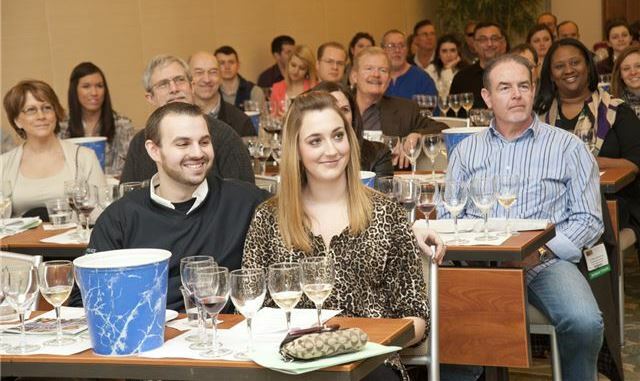 Whether you’re more a fan of white wine or red, small seminar or exclusive tasting, or Washington or Lincoln, we’ve got something for you at the Boston Wine Expo. Get your tickets and be sure to book ahead to guarantee space in one of the fun seminars. Bottoms up!